Your small business uses (or plans to use) a computer network, as most do, to streamline work processes and improve efficiency. Most small businesses do not have an IT department to maintain, manage, or expand a network since on-site IT departments cost a fortune and impractical in most cases (for small businesses). What's your option then? Outsourcing. Managed IT service providers to be precise. Outsourced computer networking services is a viable and cost-effective solution for your small business. Computer networking knowledge is a specialized niche that is becoming increasingly more complex. Your business depends on a functioning, optimized, and secure network available to handle the workload 24/7. By outsourcing your computer network needs, you receive IT knowledge that is up-to-date, cutting-edge, and available around the clock and could also be customized based on your business' needs. And the best part? You avoid downtime. Managed IT service providers GUARANTEE that your business should be up and running 24/7 365. Let's go over some of the critical areas that need support and see how outsourcing computer networking services can help you function at optimum levels. Even at a basic level, your computer network needs a plan for the initial installation and future expansion. Even if the initial network is small, you need solutions that are flexible so future expansion is easy and not costly. Solid planning from knowledgeable IT professionals can be invaluable from the early stages. By choosing an outsourced computer networking services company that can assist you in these planning stages, you will have a team who knows your setup and how to expand it quickly and easily. A managed IT services provider that asks questions about your current and future needs is a good sign they can handle both your growth and whatever comes with it. If you already have a small business network in place, it still pays to call in an IT service provider that offers computer networking services to evaluate and maintain it. They then have a blueprint of your existing network and can be called in when the need arises for expansion or troubleshooting of network problems. If you want to know more about network planning, you can check out this article from Dummies. It provides a detailed description of planning your networking and defining its purpose. Technologically, the world moves at a record-breaking pace and your small business needs to keep pace to remain competitive. The choices for any type of technology today are mind-boggling and unless you are an IT professional yourself, are not easily understood in many cases. Outsourcing your procurement of new technologies can assist you in making the best choices with a minimum of wasted dollars. You’re a businessman first and foremost, why are you spending all your time thinking about improving your IT needs with new technologies when managed service providers exist to provide you with the same type of service - saving you time and saving you money?” says Emil Isanov, CEO, ETech 7. 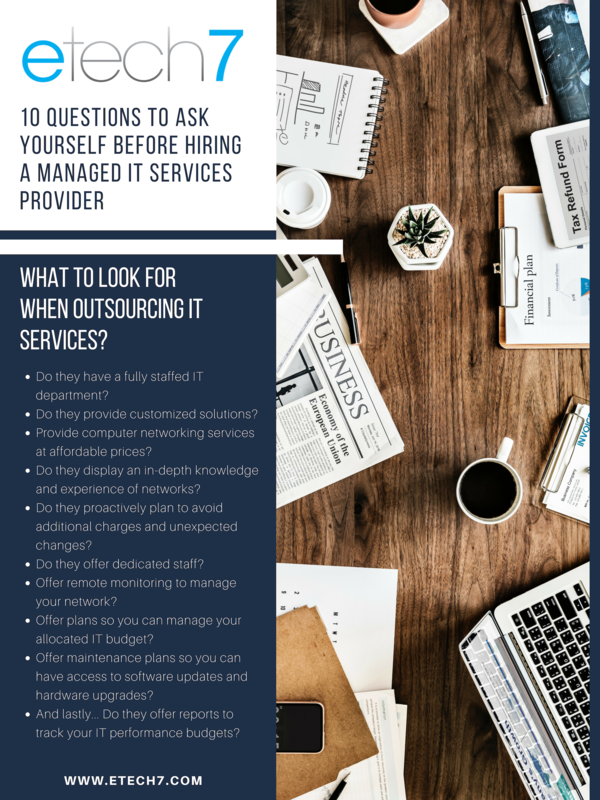 Outsourcing your computer networking services means the procurement of new technologies is a phone call and a consultation away with your outsourced IT company. Maintaining and managing a network is an ongoing process. Maintenance of the computer network such as backups, security measures, and workstations evolves over time. Software glitches, hardware failures, user errors and hacking attacks are some of the factors that can affect your computer network in an adverse way. Managing these possibilities are vital to the day-to-day operations of your business. Having an outsourced IT company that offers computer networking services managing these factors means security and peace of mind. It is an easier task to forecast how much you will have to spend to maintain and manage your small business network as well. While the IT company has full responsibility for these tasks necessary to keep your business functioning, you have full control over the budget and decisions. 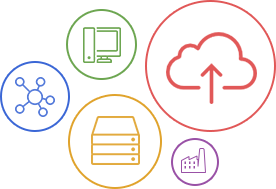 Managed service providers offer basic IT plans that are structured as packages or on an as-needed basis. This flexibility helps you control your budget while meeting your IT needs. Finding a company that meets your computer networking services needs means considering several factors. Here is a checklist of questions to consider so you can choose the right IT computer networking company for your small business. Outsourcing computer networking services for small businesses is a cost-effective and beneficial decision to keep your company on track and competitive. Select a plan that suits your needs for peace of mind, so you can concentrate on business matters at hand and leave your network to the experts. Interested in knowing more about IT plans and what it would entail for your business? ETech 7 offers a free network check for your business. Check out the form below and schedule a meeting today!